Because of the unpredictable nature of your work, modern firefighters must prepare for and readily adapt to any and all unforeseeable dangers. What was once the norm regarding what to expect on-scene is no more. Everything from atmospheric threats to environmental hazards must be considered before arriving to the fire ground. So prepare by starting from the ground up with the new Haix Fire Eagle Air 11-Inch Boots. Haix, a leading manufacturer of functional features for the fire service, infuses each boot with practical research and creative innovation, which allows them to meet and exceed the rigorous standards set by fire service professionals. 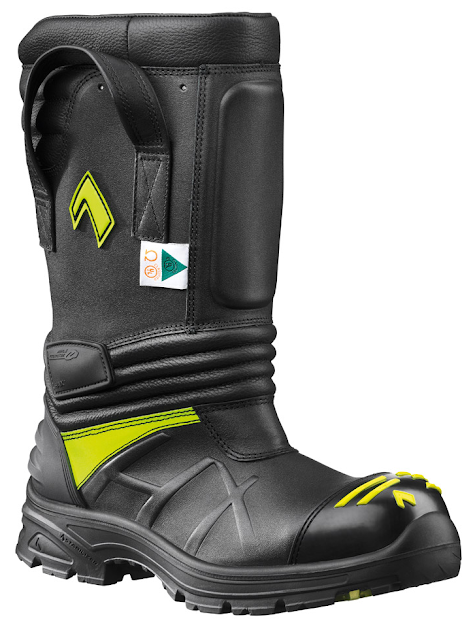 Regarded as Haix’s lightest structural fire boots to date, the Haix Fire Eagle Air 11-Inch Boots are ideal for use in unstable structures that are built from lightweight materials. The boots have an athletic fit and feel that is complimented by their high levels of protection, thereby allowing you to immediately respond to changing conditions when on the frontlines of a firefight. Along with being dual-certified for structural firefighting and Hazmat, NFPA 1971, 1992, the Haix Fire Eagle Air 11-Inch Boots’ innovative, athletic soles are designed to keep you feeling like you’re on terra firma, regardless if you’re standing on water, ice, or snow. Superior traction is critical when battling the unpredictable conditions of a fire, which is why the boots’ 2-component tread features superior stability and support when you need to get the job done correctly. Additionally, the dual-colored soles feature augmented shock absorption and keep your feet warm and cold insulated. You can be assured that you’ll be seen – even when working in the smokiest of conditions – thanks to the unique, signal-yellow color emblazoned on each sole. Stay on-point with these cutting-edge boots. For more information and to get yours, be sure to visit TheFireStore.com.